It’s hard to overstate the importance of good gut health—which goes way beyond feeling bloated or not. A healthy gut also helps you lose weight, absorb more nutrients from your food, stave off sickness, and even helps you feel happier and more confident, says health coach Robyn Youkilis. She feels so passionate about great gut health that she wrote a whole book on the topic: Thin From Within: The Go With Your Gut Way to Lose Weight. “Serotonin is your body’s ‘feel good’ neurotransmitter, which helps regulate anxiety, happiness, and mood,” says Youkilis. “It’s estimated that 90 percent of your serotonin is made in your digestive tract, and that the production of this chemical is reliant on healthy gut bacteria.” A lack of serotonin can be what makes you feel unsettled or uncomfortable in your body, leading to yo-yo dieting and self-doubt, says Youkilis. 1. Greens: The fiber in nutrient-dense greens such as kale, collars, arugula, and spinach helps fill you up and keep you regular. 2. Healthy fats: “Fats are essential for proper absorption of most vitamins and minerals,” says Youkilis. Aim for sources like coconut or olive oil, nuts, or avocados. 3. Protein: Protein keeps you full and stabilized blood sugar, which helps you avoid sugar cravings. Youkilis recommends wild salmon, organic chicken, grass-fed beef, or canned wild sardines. 4. Fermented Food: A healthy microbiome in your gut keeps digestion running smoothly, and fermented foods are packed with probiotics. Youkilis advises starting with one to three tablespoons of fermented vegetables at each meal, be it sauerkraut, kimchi, fermented carrots, or fermented beets. 5. Cooked Vegetables: “Steamed or roasted vegetables always make a meal feel more grounding and filling,” says Youkilis, which is an important part of sticking to any diet. Want an example of how it’s done? Here, she shares a gut-friendly recipe she makes when she’d craving comfort food: spaghetti squash bolognese. 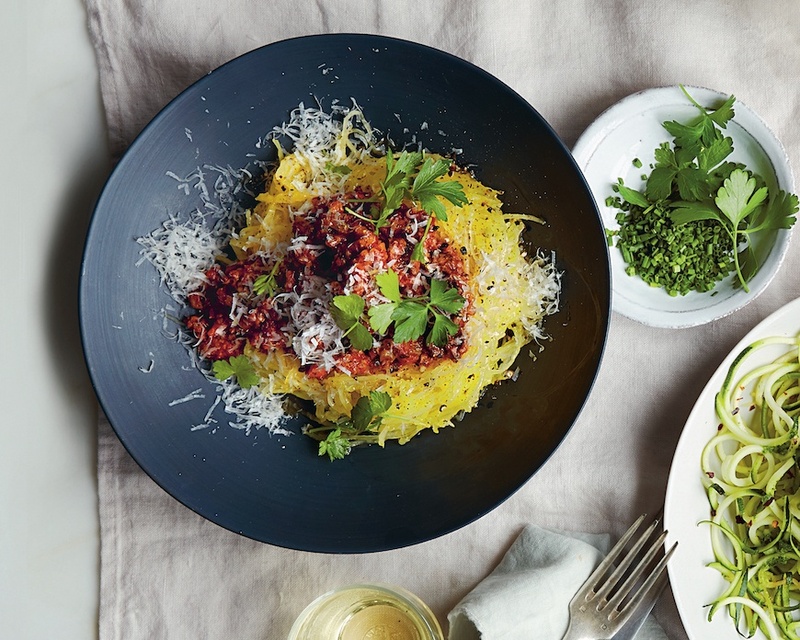 “When I’m craving pasta, I often find that what I really want is heaps of tomato sauce, so I’ll make spaghetti squash in the style of classic Bolognese,” says Youkilis. “I switch the ratio so there’s about twice as much veggies as meat.” Serve it with a side of greens topped with fermented sauerkraut for a comfort food dinner that will make you feel amazing. 2. Rub coconut oil on the cut sides of the squash and season with salt and black pepper. Set the squash cut-side down on a baking sheet. Bake for 30 to 45 minutes, until fork-tender. Use a fork to scrape the squash into strands. Discard the skin. 3. In a large skillet, heat the olive oil over medium heat. Add the onion and garlic with a pinch of salt and cook, stirring, until the onion is translucent, about ten minutes. 4. Add the rosemary, celery, and carrots, season with a bit more salt and black pepper, and cook, stirring, for 5 minutes more. Add the ground meat and cook until browned, seven to ten minutes. 5. Add the crushed tomatoes and season with salt, black pepper, and the red pepper flakes. Simmer the sauce for five to ten more minutes. 6. Serve the sauce over the cooked spaghetti squash immediately, or reduce the heat to maintain a simmer, cover, and keep warm for up to 20 minutes before serving. If you need more ideas for spaghetti squash, check out four healthy ways to use spaghetti squash. Plus, six ways to eat more miso, a powerhouse fermented source.